It is believed that chopsticks have been around for about 5,000 years and that they were first used in China. The reason behind their initial extended use in China is quite interesting. When fuel was scarce, ancient Chinese people started to cut food into small pieces so it would cook faster and use minimal fuel. Because the pieces were so small, there was no need for a knife at the table so the bite-sized pieces could be picked up with chopsticks. 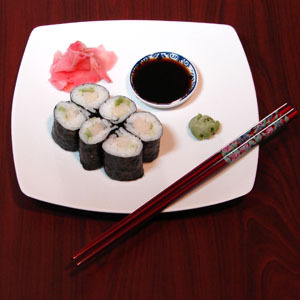 Around 500 A.D. the use of chopsticks spread from China to the areas now known as Japan, Vietnam and Korea. Interestingly enough, at first in Japan, chopsticks were only used during religious ceremonies. They were connected to each other, and the implement resembled tongs. As they slowly became more popular, chopsticks began to be made from various materials and turned into slightly different shapes according to the country they were used in. The original Chinese ones were more squared and had blunt ends (a design still common today) whereas the Japanese ones were rounded and had a thinner tip. The first Japanese chopsticks were made out of bamboo and were used only in religious ceremonies. As the years passed and chopsticks became more popular, they were made out of different materials. The wealthy had their chopsticks made of silver, gold, jade or other precious materials. It was a common belief among many Japanese dynasties that silver chopsticks would turn black if they came in contact with poisoned food, and therefore were a great way to stay alive. Although modern science disproves any connection between poisonous substances like cyanide and arsenic with turning silver dark, substances from some rotten food items can cause the reaction. Korean chopsticks are made of stainless steel and have a flat rectangular cross section and have engraved ornaments. In today’s times chopsticks are not only traditional utensils in Asian countries but also very popular in Western countries as well, where Asian cuisine is readily available in a variety of restaurants.